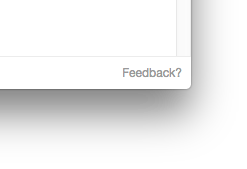 We've made it even quicker for you to send us feedback on Notejoy. Just click the Feedback? link in the bottom-right corner of Notejoy and send away. We'd love to hear from you on what you love about Notejoy and what you'd like to see improved. Found a bug? Have a question? Let us know!